I have always viewed my portrait projects as a catalyst to bring communities together. This summer’s project for Art on Sedgwick was no exception. We worked to soften the economic, racial and age divides across the Old Town community. As always, these projects are collaborative; thanks to Charlie Branda, Hannah Dykstra and the students for their hard work in the classroom and out. Thanks to the Old Town Merchants Association for letting teenagers draw us all together by letting them draw all over all over their windows! As the Cabrini Green Housing Projects were removed and the neighborhood at the south end of Old Town began to gentrify, there was still a HUD project west of Sedgwick. The median income was $9,000. Old gang boundaries still crossed the neighborhood. Everyone avoided Sedgwick. African-American parents were afraid that some white person would call the cops on their kids. East of Sedgwick the median income was $95,000. White folks were afraid of getting mugged. Everyone avoided Sedgwick St.
At a women’s retreat that Charlie and my wife, Jeanine, attended, she ventured her dream of an art center to the gathered women. Despite having no experience with art, she said she wanted to start the art center herself. Arriving home from the retreat, Jeanine said, “Charlie’s starting an art center” I said, “I’m in.” Charlie named it Art on Sedgwick. 2018 marks our fifth year. When we got a grant from After School Matters, it seemed like a good house keeping seal of approval. If you want to find out more check out this article from the Associated Press. It got picked up across the country: NYTimes, Washington Post, Christian Science Monitor, San Francisco Chronicle. After School Matters funds a grant for Art On Sedgwick. Art on Sedgwick uses art to catalyze larger social connections. 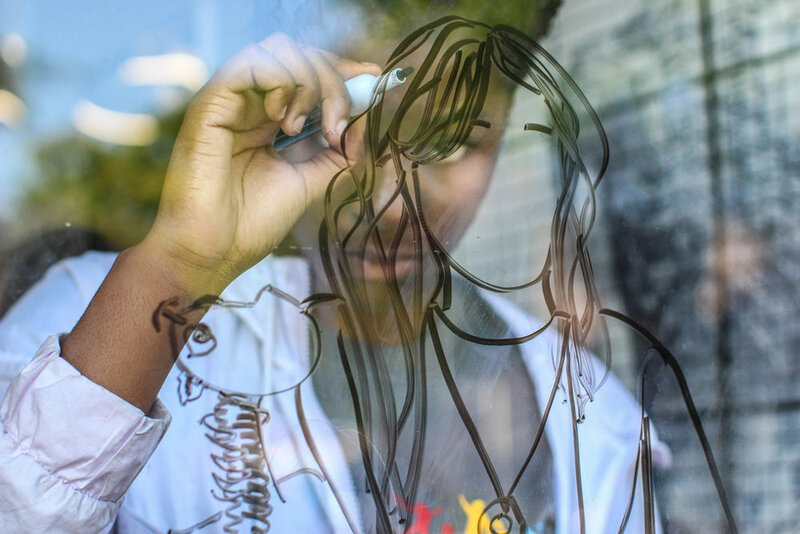 This summer After School Matters —a Chicago non-profit that provides Chicago public high school teens opportunities to explore and develop their talents, while gaining critical skills for work, college and beyond— funded a grant to AoS for me to teach a figure drawing class that would culminate in high school students doing dry erase marker drawings of Old Town business people on their shop windows. Of course, the students had to speak with the business regarding the project; the business people got to know the students name. Perhaps they might even think about hiring some of them!